Tip $25 and get Custom mp3 recording of any original or public domain song/ballad in my repertoire. Kathy_Strom: No refund! Every note and story are more than worth the hassle of constant reloading. Kathy_Strom: Good point, Ellen. I may ask CW to refund their potion. Sad, because Andrew prepared so well for this and it would be an awesome show! tracy-grammer: Cutting out here as well. Need a new way to monetize online shows. This model has been wonky for years. Kathy_Strom: Now every time I reload it stays frozen with a message: Cannot load M3U8: 404 Not Found. Robert Shepherd: Having to reload almost constantly now. Damn it. tracy-grammer: Hi pants. Keep going. Robert Shepherd: Spoke too soon. Dynamezz: Really enjoyed your short, well-prepared comments. And singing LOTS of short songs. THANK YOU! Sorry Concert Window wasn't up to the task...today. Kathy_Strom: I also get "Cannot load M3U8: Crossdomain access denied." richard.duffee: Andrew, It's continuous re-loading. Richard L Walker: Reloading current page gets everything back. Tis a nuisance but it gets the audio and video back. Melissa DansingWaters: There is a "Help?" button in red lettering under the picture/feed in a white border. It offers some suggestions to try. It's not on Andrew's end and unfortunately nothing he can do to fix it. Kathy_Strom: Andrew, my heart breaks for you because this is such a special and wonderful show. You should not have to be distracted by all this technical stuff beyond your control! Robert Shepherd: A special show indeed. Unnprecedented. Would love to see you do this show in a live concert or in a Youtube video. Ellen Swaim: The help suggestions do not help, because their feed is messed up. I can't figure out how to contact them. Can anyone? I can't get through more than a verse at a time. Kathy_Strom: Same here, Ellen. Often it doesn't come back when I refresh, and sometimes it comes back but keeps repeating the same snippet over & over again! Thanks Melissa. I'll write CW. Robert Shepherd: That Orpheus got around! Ellen Swaim: Me too. I just wrote them too. I can't get through a verse without having to reload. Robert Shepherd: Same here. I reload and get a repeat of the last snippet. Then it freezes again. Richard L Walker: Many who recreate dances make those same liberties with changes. Kathy_Strom: Andrew, do you have CW support during the show? Kathy_Strom: Andrew should be paid, but CW should give us back their portion! richard.duffee: I agree with Kathy. Ellen Swaim: It's not a refund issue for me, and that doesn't help the person giving the concert. But maybe I'll ask for the refund and then send it to you. Robert Shepherd: What a rare and wonderful opportunity to be able to get the windfall of Andrew's vast learning about Burns's poetry and music! Ellen Swaim bought reward: "a lead sheet w/ chords & lyrics of any Burns song I sing. " Richard L Walker: If you use Facebook, please post the URL. It would help with a cut and paste. Richard L Walker bought reward: "a lead sheet w/ chords & lyrics of any Burns song I sing. " Robert Shepherd: Going to the Facebook page now. Much better video and sound. Dynamezz: Thanks for the Facebook option. It's great! GaryMartin: Wow! I gave up 50 minutes ago and emailed tech support, but left the window open. Suddenly it's working without my doing anything. Kathy_Strom: It's much better at https://www.facebook.com/andrewcalhounbard/videos. PaulaK: I caught the last half, sorry not to have seen it all. Wonderful program, Andy-- thank you! PaulaK bought reward: "a lead sheet w/ chords & lyrics of any Burns song I sing. " douglasthomson: Thanks, Andrew. What a delight! What was your favorite part of the performance? I like the background stories, particularly when the characters of the song are identified, The stories help me make more sense of the song and contribute to exactly how you sing it. You have talent as a character actor. The whole thing is a great relief from our phony "culture" which is just an elaborate method of advertizing and deception. It's wonderful to know what people felt and thought when they felt and thought for themselves and their friends instead of how we feel as bonded wage slaves imitating and glorifying our masters. BUT CW provided terrible service for which they do not deserve 30%--I spent a lot more time reloading than I could spend listening. Yes. The show was wonderful. But there were technical difficulties both in sound, video quality. The window feed also kept freezing then kicking people out of the show, so that they would need to go back to the link. I love you and uncle Andrew, that was wonderful. I've been reading Owen your Burns translations, I can't help but get a little scotts in my voice which he seem to enjoy. Thanks, David! I wish I could get to California. Custom mp3 recording of any original or public domain song/ballad in my repertoire. "Andrew Calhoun is a powerful songsmith, a quiet and sly performer, and fine traditional singer as well... fascinating and unpredictable." Andrew Calhoun's music is innovative and rooted in tradition. In forty years as a performer he has evolved an increasingly varied repertoire including original songs, Irish and American folk songs, Scottish ballads, African-American spirituals, hymns, historical background, comic songs and poems and songs by writers such as Dave Carter, Mary Oliver and Robert Frost. At age seven, Andrew memorized W. B. Yeats' "Song of Wandering Aengus," thus earning a nickel from his mother. He got his first guitar in 1967 at the age of ten, and began writing songs at twelve. By the late seventies, he was performing in the Chicago folk scene. Six months of janitorial work at the DAVEA Center in Addison, IL, funded a trip to Europe in 1977 leading him to hear Martin Carthy at the Cambridge Folk Festival in England, and Carthy along with Leonard Cohen have remained guiding musical inspirations. He has since toured internationally, performing at folk clubs and festivals, pubs and house concerts. In 1992, Calhoun founded Waterbug Records, an artists' cooperative folk label which has grown to 115 titles, bringing some of the brightest singer-songwriters and folk musicians to an international audience. His own recordings have been released on Hogeye, Flying Fish and Waterbug Records. Recent projects include a comedy book, The Trilogy Trilogy, and his twelfth recording, Living Room, a collection of original songs. Recently he has worked with Andrew Calhoun and Campground; the band Zozo; and in a duo and trio with daughter Casey Calhoun. 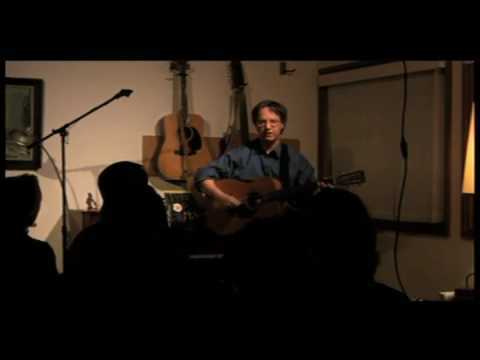 In October 2012, Andrew was given the Lantern Bearer Award for twenty-five years of service to the folk arts in the Midwest by the Folk Alliance Regional Midwest.